The parts are often subjected to manual inspection, which can lead to defects being missed due to tiredness of the inspectors. For automatic surface inspection of geometric parts, the robot-guided reflectCONTROL Automation inspection system has been developed. The system projects a striped pattern onto the measurement object. Defects on the shiny surface cause deviations from the striped pattern which are recorded by cameras and evaluated by software. The compact deflectometry sensor, which consists of a monitor for the striped pattern projection, as well as up to two cameras, is guided over the measurement object by a robot. This enables an easy, fast and reliable 3D inspection. Using the 3D model (CAD), the robot program is created. The robot guides the sensor over the relevant surfaces and inspects the surface. The defects found are then evaluated and displayed in the 3D model. The surfaceCONTROL surface inspection system of INB Vision AG, a company belonging to the Micro-Epsilon group is a specialist for inspection tasks on matt surfaces. It comprises a modern 3D sensor and the software for the data analysis. 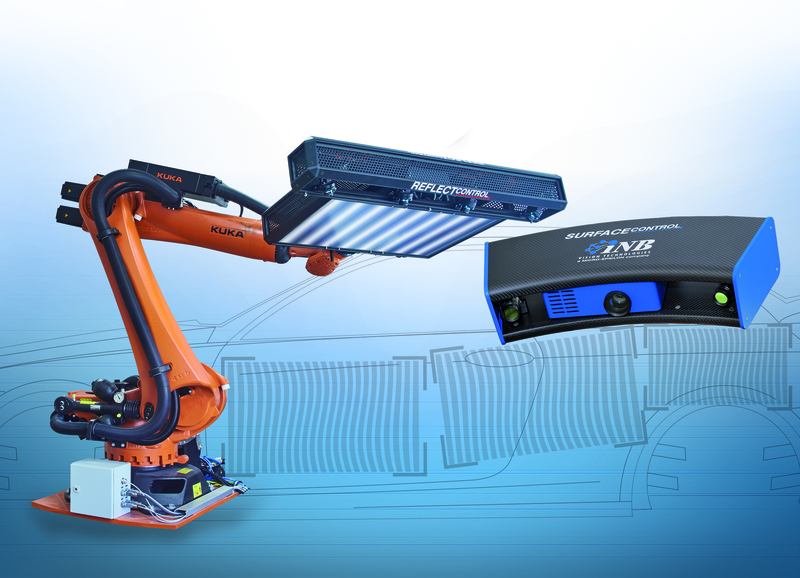 This new 3D sensor achieves a significantly higher inspection speed, together with increased measurement accuracy by using a fast projection unit and new cameras. The sensor is optimized for both integration in assembly lines and for robot connection. As well as a 3D sensor for surface inspection, the system alternatively includes two software packages for the evaluation of 3D data. First, the surfaceCONTROL DefMap3D analysis software for laboratories and the measuring room, offering different tools for the objective evaluation of local deviations and a full-surface back projection of the analysis results onto the component. DefMap3D is available in several versions, adapted technically and in terms of price to the respective requirements. Second, the surfaceCONTROL Inspection Tools for automatic examination of surfaces being optimized for robot-supported inspection tasks. The sensor based on the structured light projection scans the surface and provides a 3D point cloud of this surface. Therefore, a sequence of structured light pattern is projected on the surface. The calibrated cameras use this pattern for searching corresponding points, from which the 3D data is calculated. Calculation and evaluation of the data are performed using the correspondent software on an IPC.